As I write this at the beginning of July, the sun is scorching the plants in the garden, turning the grass brown and leaving me in a perpetual damp ‘glow’; when you read this at the end of July, we may all be complaining about the rain and the lack of sun and grumbling about this ‘typical English summer’! We hope you enjoy the summer break, whatever the weather and that you come back full of enthusiasm when the groups start up again in September. If you are interested in gardening and/or visiting gardens, turn to page 10 where Sue Taylor has written an article about the possibility of forming a new group for those who love gardens, with visits to NGS gardens, plant / seed exchange etc. Some people have also wondered about the possibility of a group learning a new language, maybe Spanish. Let Lynda Clifford know if you are interested in being involved in either of these (01249 653251). It is 25 years since North Wiltshire U3A began in 1993. A little research has revealed that 14 of our founder members are still members! Some of them still play a very active role in running groups and several have served on the committee. Joan & Albert Lindsey, Margaret Ducat, Doris Roddham, John Greenwood, Alan Thorpe, Jean Robertson, Tony & Rose Mayo, Betty Coleman, Eileen & Malcolm Hodges, Jack Endacott and Tricia Weaving. In my previous ‘Chairman’s Chat’, I commented on the apparent reluctance of Spring to do its stuff, and bring some warmth. Well, now hot summer weather has come in with a bang! We must remember to drink plenty of water, and beware of spending too much time in direct sunlight. I believe that ice-cream is rumoured to help, as is a small quantity of chilled white wine, Pimms, or beer! This year, 2018, marks 25 years since North Wilts U3A was founded in October 1993. It’s worth noting that we still have 14 founder members on our books; we ‘newcomers’ have a great deal to thank them for. Your committee is considering ways in which this milestone can be celebrated. Our May and June meetings were not just interesting, but also inspiring. In May, Elizabeth Odell gave a talk about ‘Shelterbox’. This amazing charity started when someone saw a news report of a disaster and the desperate need of those affected for some simple material aid. He went into his garage and looked at what items he had that would help. This grew into the idea that it would be possible to provide families in a disaster area with a box containing essential items. The project started as a millennium project, linked to Rotary, and has helped millions of people in many countries including Haiti, Nepal and Myanmar. The boxes it provides include tarpaulins and water filter systems. Our speaker passed a gruelling selection process to be part of the team going to Haiti. The June meeting was given by Rachel Bown, daughter of our member Nigel Bown. 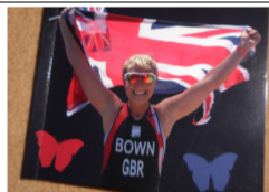 Rachel is a GB Triathlete who overcame a brain tumour to return to the team. Her ‘day job’ is a Special Educational Needs teacher and she feels it is part of her job to make sure that everyone can have high quality opportunities to take part in sport. While she was at Sheldon School she was inspired to write by her English teacher, Frances Alexander (one of our Newsletter editors), and that inspiration led Rachel to write a book about her experiences. Before she left, Rachel made us do exercises to earn a copy of her book as a prize – it was won by Margaret Mountain!! After our summer break, I look forward to seeing you again in September. £12.50 single, £24.00 for a couple. as agreed by members at A.G.M. in March. HSBC Bank account, North Wilts U3A, Registered Charity number: 1048393. Sort Code: 40-17-17, account number: 71419927. Please also email northwiltsu3a.contact@gmail.co with your name, address, the amount and date of payment. 2. By cheque, payable to’North Wilts U3A’. Please write your membership number or name and address on the back for identification. 3. By cash: In an envelope, please, with your name and address or membership number for identification. Sue Taylor, 16 Brookwell Close, Chippenham, SN15 1PJ. Please enclose a S.A.E.for return receipt and new membership card. Or if Group Leaders could collect fees from their group members and give them to Sue, it would be very helpful. We aim to collect all fees by our financial year end of December. We have over 200 members, so please help by paying promptly. From horse-drawn trams to a flight box plane, Sir George White set up his flying school at Filton. He followed on with a fighter aircraft in World War I, the Bristol F2B with a Rolls Royce engine. Post-war they went into road building, lorries and cars and then a passenger-carrying plane, the Bristol Babe. In 1939 the 501 squadron flew the Bristol Bulldog, Hurricane, Spitfire and Blenheim from Filton. The Brabazon was built there. The Bristol Britannia, the whispering giant, saw service in 1952 carrying 139 passengers. Later they built the Freighter for trade and passengers, the Bristol Type 173 twin rotor helicopter equipped with gas turbine engines, an anti-aircraft missile, Bloodhound, the Skylark, part of the Hubble space telescope, a submersible, and in 1980 a short haul airbus A320 with parts from Spain, France, Germany and the U.K.
Thousands of personnel are employed in Aerospace Bristol and the exhibition portrayed the entrepreneurial skills of both management and employees in making progress and ingenuity in changing circumstances. Affiliation to the RHS for information and free visits. Trips to gardens including those open by the NGS. Finding out about local wildlife. Links with local agricultural/horticultural college. In North Wilts we are very well placed to use these ideas. The towns and local villages all have beautiful parks or open spaces for us to enjoy. Lackham College is nearby. There are gardens to visit in all shapes and sizes. Larger ones include Bowood with the stunning rhododendrons and several National Trust properties; The Courts in Holt is a particular favourite of mine. Several local villages have Open Garden events. In the past I have enjoyed wandering from cottage to cottage in Marshfield, picking up ideas and bargain plants! Recently in Box, I visited what appeared to be a modest bungalow, but the enormous back garden had fabulous herbaceous borders and a meadow full of wild flowers. There were stunning views across the valley towards Colerne. Every summer the NGS provides many opportunities for local visits. I have particularly enjoyed Bowden Park and Dauntsey Open Gardens this season (See photo on Page 19). I am looking forward to seeing 130 Ladyfield Road in Chippenham again – this year on 29th July – amazing clematis! Delicious tea and cake always add to these occasions! Lynda Clifford (01249 653251) and Dora Emmett (01249 812658), Groups’ Co-ordinators, would love to hear from any interested members. We could then set up a meeting in the Autumn to plan a programme for the gardening year ahead! Basic information about groups, contacts and dates is held in the 'Groups' page. This section holds information about upcoming events within groups. Our members take pictures on holiday, which are then transported to our large TV with a commentary. Or we show DVDs etc. Members have been retrieving old favourites from their stocks of games so we have had fun trying one or two of these, as well as playing regular games of Scrabble and Rummikub. Meetings continue to be at 2p.m. on the fourth Monday of the month. New members welcome. The book group is getting established. There have been a few changes but we have read a variety of books so far and enjoyed lively discussions. Having just discussed ‘The Secret Life of Bees’, we are now reading ‘The Essex Serpent’. Further new members are welcome. Contact Pip for more information. Due to Maureen Hinton's imminent relocation, Lynda Clifford, will in future be the contact person for the Common Thread group, which will continue as a casual drop-in session. Discussion 2 has decided to close because of lack of numbers. Our August 5th booking is now at The Plough, Kington Langley, due to a price hike of £2-95 at The Bell House hotel on top of the £13 charged last October! On a more pleasant note, the younger members of the catering team before last at The North Wilts Bowls Club have now taken on the catering, so we are booked in there for September 2nd and also for the pre-Christmas lunch on December 15th. The December lunch will be open to all, at a cost of £13 total, payable in advance, please. The booking for October 7th is hopefully at The Black Horse, Cherhill (to be confirmed) and November 4th at The Lysley Arms, Pewsham. We continue to meet in the Old Vicarage, St Mary Street, Chippenham. We cover all aspects of technology through DVDs and outside visits. 29 September (Saturday) – Visit to the Crofton Pumping Station, Gala Day. Groups do sometimes reach capacity as many meetings take place in members’ houses, where space can be limited. Please let any committee member know if you find you are unable to join a particular group. It may be possible to start a new group.